Now through April 1, 2019 at 3:00am PDT, receive automatic free shipping on all orders with the purchase of one (1) or more Aerie® bras or one (1) or more AEO® or Aerie swim item, and free returns on Aerie bras and AEO or Aerie swim item. We will include a free return label in your shipped package. Offer not valid on AEO or Aerie Clearance merchandise. Offer is valid on orders shipping to U.S. & Canadian addresses only. Offer not valid on international orders. This offer is good for U.S. standard shipping within 3 to 7 business days pending credit approval and authorization. Orders to Canadian addresses will be shipped via Canada post within 6 to 10 business days to urban areas and 15 to 22 business days to rural areas. Shopping bag must contain at least one (1) Aerie bra and/or one (1) AEO or Aerie® Swimwear to qualify for free shipping. This free shipping offer can be combined with other discount offers. No discount code is required at the aerie.com shopping bag. Not applicable toward previously purchased merchandise. All deliveries are pending credit approval and merchandise availability. Deliveries may be delayed due to carrier issues or weather conditions. Free shipping promotion and associated terms & conditions subject to change at AEO's sole discretion. Beginning March 15, 2019 at 6:00am EDT through March 19, 2019 at 3:00am PDT, receive up to 30% off select Aerie® Collection items in select Aerie U.S. and Canada stores and online at aerie.com only. Prices as marked. All prices and/or promotions at ae.com® and aerie.com are reflected in USD. Discount applies to Aerie merchandise costs only, prior to tax and shipping & handling. No discount code is required at the aerie.com shopping bag. This discount is not redeemable for cash, nor applicable toward previously purchased merchandise. Valid for Aerie branded merchandise only. Not valid on AEO® merchandise, undies, or on Gift Cards. Excludes 3rd party merchandise. Discount promotion and associated terms and conditions subject to change at AEO's sole discretion. 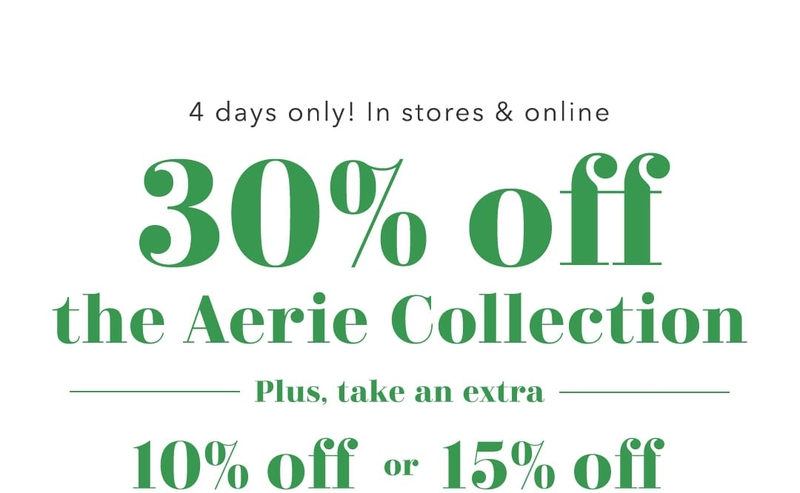 Offer valid beginning March 15, 2019 at 6:00 AM EDT through March 19, 2019 at 3:00 AM PDT at ae.com® or aerie.com only. Offer valid for U.S. and Canada customers only. Take an additional 10% or 15% off your AE®, Aerie® or Tailgate® purchase. Offer not valid on Aerie undies, clearance merchandise, 3rd party merchandise, AE x Marvel, Aerie x Marvel, AEO APT, American Beagle or Gift Cards. You must enter the discount code 1L49J6AE63374W27W9KD in the ae.com or aerie.com shopping bag to receive the discount. This discount offer cannot be combined with other discount codes. Offer applies to merchandise after discount costs have been applied, prior to sales tax and shipping & handling costs. This discount is not redeemable for cash, nor is it applicable toward previously purchased merchandise. Offer is valid on Tailgate orders shipping to U.S. addresses only. All prices and/or promotions at ae.com or aerie.com are reflected in USD. Discount promotion and associated terms and conditions subject to change at AEO's sole discretion. Beginning March 15, 2019 at 6:00am EDT through March 19, 2019 at 3:00am PDT, or while supplies last, receive a free Aerie® Swim bag (style 9960-1644-900, a $29.95 USD value) with any Aerie bikini top & bottom purchase or a one piece swimsuit purchase at aerie.com only. After all discounts have been applied, prior to sales tax and shipping & handling. All prices and/or promotions at ae.com® and aerie.com are reflected in USD. AEO® merchandise, 3rd party merchandise and gift cards not included. Offer is valid while supplies last. Limit one free Swim bag per customer. This offer is not redeemable for cash, nor is it valid toward any previously purchased merchandise. This offer can be combined with other offers. Offer's value will not be refunded on merchandise returns.